As November is Diabetes Awareness Month we’ve decided to take some time to talk about this killer disease. You hear, almost daily, in newspapers, on television, how diabetes is on the rise around the world. You often hear it’s a “lifestyle” disease – but is it? Do you really know what it is? We’re going to try to separate the fact from the fiction. So, in general, what is diabetes? Diabetes is when your blood glucose, also called blood sugar, is too high. Blood glucose is the main type of sugar found in your blood and your main source of energy. Glucose comes from the food you eat and is also made in your liver and muscles. Your blood carries glucose to all of your body’s cells to use for energy. Your pancreas—an organ, located between your stomach and spine, that helps with digestion—releases a hormone it makes, called insulin, into your blood. Insulin helps your blood carry glucose to all your body’s cells. Sometimes your body doesn’t make enough insulin or the insulin doesn’t work the way it should. Glucose then stays in your blood and doesn’t reach your cells. Your blood glucose levels get too high and can cause diabetes. Now there are three different types of diabetes – Type 1, (or what is called Juvenile Diabetes) Type 2, (often called Adult Onset Diabetes) and Gestational Diabetes (occurring during pregnancy). So, what is type 1 diabetes? Type 1 diabetes is an autoimmune disorder – often referred to as Juvenile Diabetes – that develops most often in young people. In autoimmune disorders, the immune system mistakenly attacks the body’s healthy tissues as though they were foreign invaders. A severe attack can interfere with the function of that body part. In type 1 diabetes, your body no longer makes insulin or enough insulin because the body’s immune system, which normally protects you from infection by getting rid of bacteria, viruses, and other harmful substances, has attacked and destroyed the cells that make insulin. However, the term Juvenile Diabetes is a misnomer as it can also develop in adults. 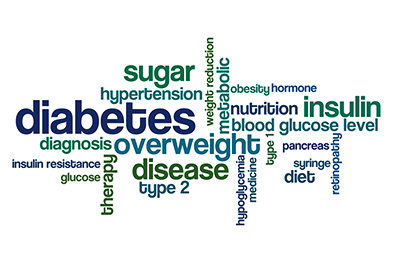 Now let’s talk about type 2 diabetes – the one they say is a lifestyle disease. Type 2 diabetes has several causes: genetics and lifestyle are the two biggest. One, both, or a combination of these factors can cause insulin resistance – meaning that your body doesn’t use insulin as well as it should. Insulin resistance is the most common cause of type 2 diabetes. Type 2 diabetes can be hereditary. That doesn’t mean that if your mother or father has (or had) type 2 diabetes, you’re guaranteed to develop it; instead, it means that you have a greater chance of developing type 2. Researchers know that you can inherit a risk for type 2 diabetes, but it’s difficult to pinpoint which genes are the culprits. Research is ongoing to try to isolate which genes carry this risk. Although genes do play a role in type 2 diabetes, lifestyle choices are also critical. You can, for example, have a genetic mutation that may make you susceptible to type 2, but if you take good care of your body, you may not develop diabetes. For example, say that two people have the same genetic mutation. One of them eats well, watches their cholesterol, and stays physically fit, while the other is overweight (BMI greater than 25) and inactive. The person who is overweight and inactive is much more likely to develop type 2 diabetes because certain lifestyle choices greatly influence how well your body uses insulin. Pregnant women who have never had diabetes before but who have high blood glucose (sugar) levels during pregnancy are said to have gestational diabetes. According to a 2014 analysis by the CDC, the prevalence of gestational diabetes is as high as 9.2%. Researchers don’t know what causes gestational diabetes, but they have some clues. The placenta supports the baby as it grows. Hormones from the placenta help the baby develop. But these hormones also block the action of the mother’s insulin in her body. This problem is called insulin resistance. Insulin resistance makes it hard for the mother’s body to use insulin. She may need up to three times as much insulin. Gestational diabetes starts when your body is not able to make and use all the insulin it needs for pregnancy. Without enough insulin, glucose cannot leave the blood and be changed to energy. Glucose then builds up in the blood to high levels. This is called hyperglycemia. Type 1 diabetes and gestational diabetes are treatable but you really can’t prevent them so for our discussion purposes, we’re going to concentrate on the one you CAN either prevent or help control – type 2 diabetes. According to a study published online in JAMA today, nearly 50% of adults living in the U.S. have diabetes or pre-diabetes, generally the result of obesity, poor diet or lack of exercise leading to the metabolic syndrome. And it’s ridiculously expensive. People with diagnosed diabetes incur medical expenses of about $13,700 per year, and about $7,900 of that is directly attributed to diabetes. People with diagnosed diabetes, on average, have medical expenses approximately 2.3 times higher than people without, and they account for more than 1 in 5 health care dollars in the U.S. But those aren’t the only costs. The hidden costs of this disease are astonishing. According to government statistics, it costs the taxpayers, yearly, $5 billion in increased absenteeism, $20.8 billion in reduced productivity at work, $2.7 billion in reduced productivity for those not in the labor force, $21.6 billion a result of disease-related disability, $18.5 billion in lost productivity due to early death for an unbelievable total of almost $69 billion per year. And who pays for this? We do. According to the government, 62.4% is provided by government insurance (including Medicare, Medicaid, and the military). So now we know what diabetes is, we know the different types of diabetes, and we know about the financial cost of this horrible disease. But what does it do to your body? If type 2 diabetes was an infectious disease, passed from one person to another, public health officials would say we’re in the midst of an epidemic. Even more alarming, it’s now beginning to show up in teenagers and children. If the spread of type 2 diabetes continues at its present rate, the number of people diagnosed with this disease in the United States will increase from about 16 million in 2005 to 48 million by 2050. Worldwide, the number of adults with diabetes will rise from 285 million in 2010 to 439 million in the year 2030. Diabetes is the leading cause of blindness and kidney failure among adults. It causes mild to severe nerve damage that, coupled with diabetes-related circulation problems, often leads to the loss of a leg or foot. Diabetes significantly increases the risk of heart disease. A recent study in JAMA suggests women with type 1 diabetes can expect to live 13 fewer years than people without the disease. Diabetes officially ranks as the seventh leading cause of death—but since death certificates sometimes list complications, rather than the disease itself, the actual number may be much higher. So now that we’ve given you all the “bad news” statistics, let’s talk about the good news. This disease, if caused by lifestyle factors, is preventable, and, in certain cases, even reversible. So what can be done to control or even prevent diabetes? Luckily, lots of things, and these are things we should be doing anyway! First off – if you’re overweight, lose a bit. Now, before you become discouraged, bear in mind that a landmark clinical trial called the Diabetes Prevention Program showed that type 2 diabetes can be prevented or at least delayed in those at high risk. Losing 5% to 7% of body weight using lifestyle approaches (healthy eating, physical activity, and behavior changes) lowered the risk of diabetes by 58%. That’s major! What does 5% to 7% weight loss look like? Let’s say you weigh 160 pounds. Losing 5% of that weight is 8 pounds, and losing 7% is 11 pounds. That’s not too bad. And even more good news: Losing this weight provides long-term protection against diabetes (provided you keep it off) for at least 10 years. Losing any amount of weight can be challenging for some. And for others, the real challenge is keeping it off. There’s no one “right” approach to weight loss. Find a plan that works for you, speak to a nutritionist, whatever it takes. But remember, there is no quick fix. It took time to gain it; it will take time to lose it.